Seven Jazz in Leeds promotes a year round programme of live gigs, both international and local. But somehow, they also find the time to run regular jazz workshops AND a jazz choir, too. Their Jazz Choir is run by vocalist Tessa Smith and meets fortnightly. The instrumental workshops are led by a number of professional musicians with Tom Sharp and Dominic Moore being the most recent tutors. These happen on a Saturday afternoon and are usually multiple times a month. Trumpeter and teacher Ian Chalk has been on a mission to provide top quality jazz education to musicians in York and his success so far has been inspiring. He directs a number of ensembles like the York Music Forum Jazz Orchestra and Big Band Initiative which meet regularly and leads weekly workshops that deal with improvisation and harmony. Recently, all three ensembles performed in York and you can see videos of the ensembles in action here. Play Jazz! 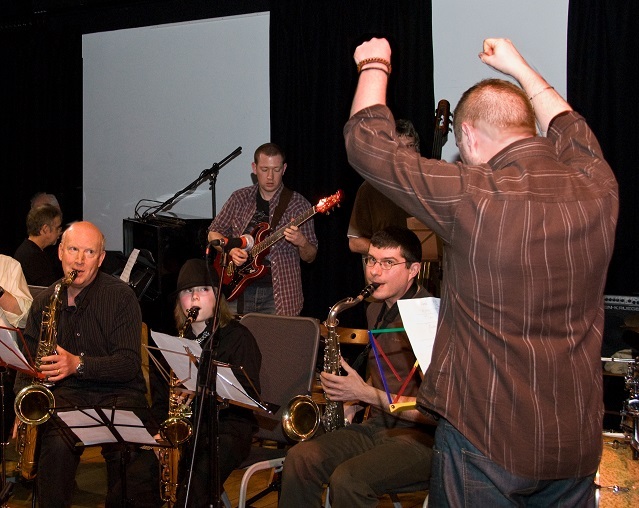 is a series of monthly workshops provided by the Jazz Coop and the Sage Gateshead. On the first Saturday of each month, a number of tutors that include Jim Birkett, Stu Finden and Zoe Gilby lead a 4 hour workshop which deals mainly with the practical side of playing jazz and improvising.